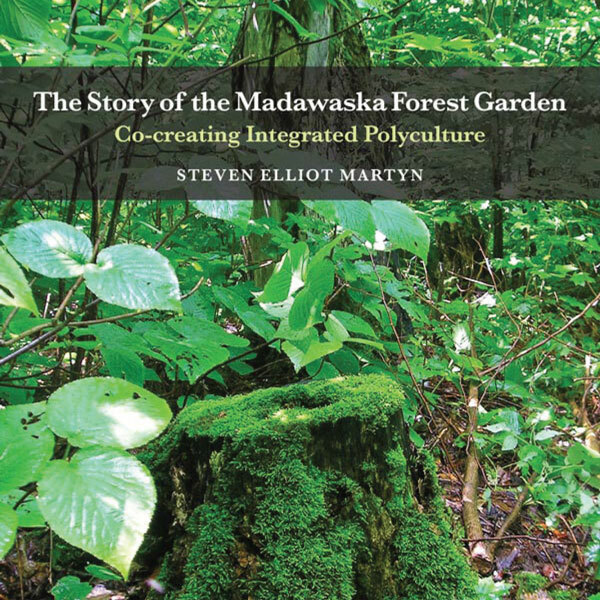 Martyn’s book is an inspiring and informative treatise on co-creating integrated polyculture. View sample pages above and read the following excerpt. In this book, I hope to demonstrate a way of working with the Earth whereby all the beings of a given place are acknowledged as the guardians and co-creators of that place. A way of gardening in which these beings are sacredly approached, and worked with in their protogenic capacity. I’m interested in promoting gardening as consensus, gardening as communion, and gardening as an extension of the ecological continuum, of which our human evolution is also part. 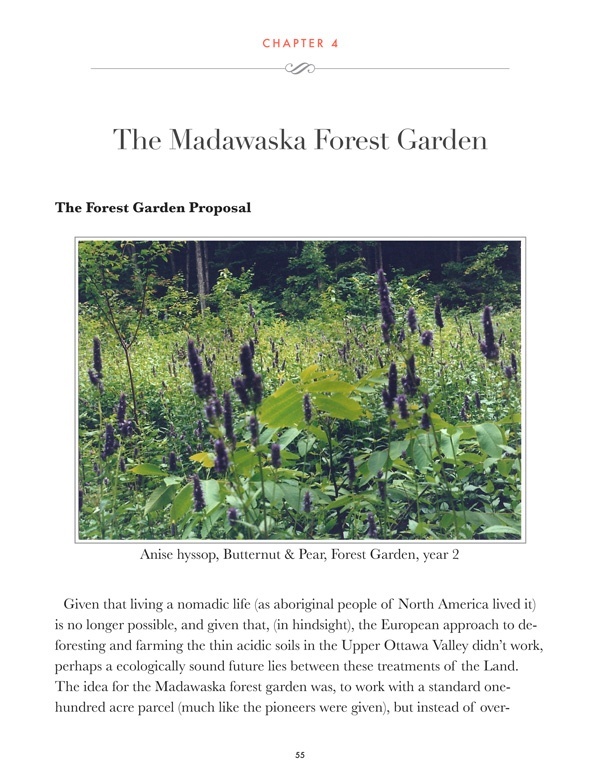 The Story of the Madawaska Forest Garden brings us from the realms of history, philosophy and theory into the intimate folds of the living Earth. This book shows us that it is not only possible to work with the Earth in a way that feeds life and culture, but that this ‘way’ is our ancestral birth right. 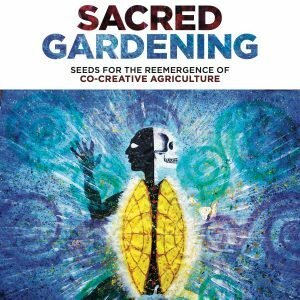 This book sheds a new light on the co-creative origins of agriculture and civilization. Steven Martyn shows us down in the dirt, what our obligation is to our partners, the plants and Wild Earth. The forest garden is a cumulative co-creative expression born from three decades of working with the Earth as a landscaper, grower and wildcrafter. The idea for the garden started with a longing to work with the wild land in a co-creative, non-invasive, non-exploitive way, like a wildcrafter/forager does. 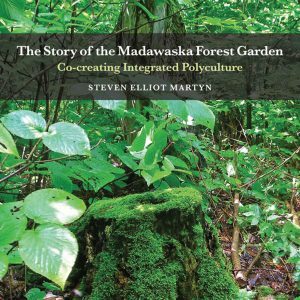 After some initial attempt on wild land by Algonquin Park Steven’s longing called him to teachers (the Lacandon Maya in Mexico) who gave the insights the Madawaska forest garden is founded on. 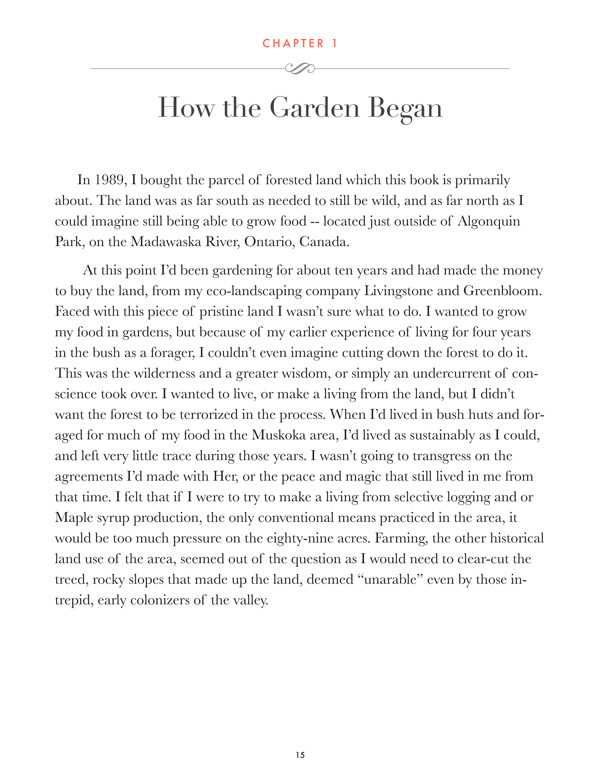 Upon arriving home in Ontario, Canada, with this revelation about forest agriculture, Steven’s research into similar land use in Ontario lead him to an MA on traditional plant use in the South Algonquin territory—and to actually making an integrated polycultural garden in the wilderness. This book contains the story of the Madawaska land, and of the history of land-use in area, as well as the steps taken in making the “Native” garden. There are abundance growing techniques as well as life lessons for the reader to draw from this story and way of working with the land. Unlike even the most radical forms of organic agriculture, such as “permaculture”, this un-permanent form of traditional Native gardening does not claim exclusive domain over the growing territory. But rather it works in a synergist way with those already present on the land, with the surrounding ecology; and with the lands natural successions of healing growth over time.